This content is now offered freely by the Hydraulic Institute as a service to the pump industry. 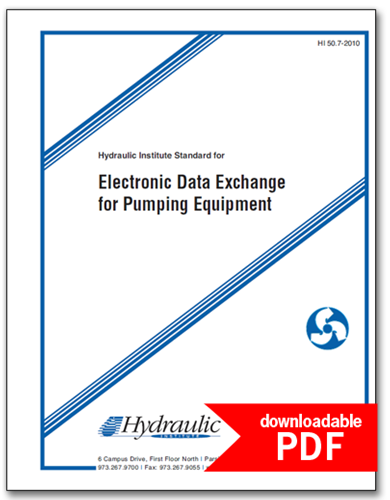 HI 50.7-2010 explains the electronic data exchange (EDE) initiative of the Hydraulic Institute promoting a common standard for the digital exchange of technical data for pumping equipment. This document also provides guidance for implementing these requirements in software applications and for the successful deployment of electronicdata exchange within an enterprise and between various stakeholders in the design, purchase, manufacture, installation, operation, and maintenance of pumping equipment. This standard was developed in collaboration with the FIATECH/AEX project and is endorsed by, and referenced within, API 610, 11th ed. ; ISO 13709, 2nd ed. ; Process Industry Practices (PIP) standards; and the ANSI/ASME B73 standards. This HI-EDE standard is intended for use by business leaders, engineers, and information technologists at organizations involved in processing technical data for all types of pumping equipment. This application allows you to view, edit, and create standard or custom datasheets. These datasheets can be easily transformed into different formats by selecting from the "Equipment" and "Datasheet" options shown on the page menu bar. Also, the contents of the datasheets can be shared with other applications as an XML file using HI Electronic Data Exchange (HI-EDE). These procedures document the steps necessary to self-certify that your software application is HI-EDE compliant for a particular pump technology (e.g. centrifugal) and data exchange level (R=required, D=desired, S=Supplemental, A=API 610 or ISO 13709).